Hello!!! 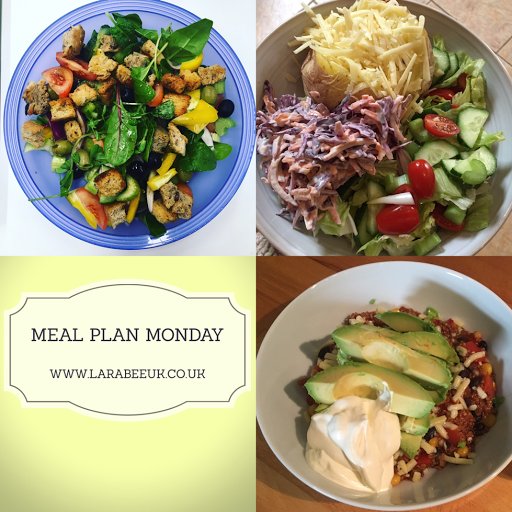 Another week, another meal plan! This is helping me use up items from the freezer and bits from the fridge which would otherwise be wasted. The whole reason I've been able to keep our January spend so low, was because we had cupboards, fridges and freezers full. I shall be doing a big shop next week, although I do plan to keep that right down too. I'm still managing to eat pretty healthily and aim to stock up with lots of specialist vegan products next week, so that will cost a small fortune I'm sure!! I'm budgeting for less than £100 for both, and will give you my shopping list in next weeks post. So a little recap from last week, I managed to stick within budget for food, having spent only £13.68, slight more than I wanted but we did have a small change so I had to add beans and bread to the list. On Tuesday, T started football training after school and T went back to playing himself so we needed a super quick dinner for them both to have before their respective games. I've accommodated for this, this week and they both want the same this week!!! D - takeaway pizza/I'm out at the tapas bar!